Dessert recipes for kids are some of the most fun to create in your kitchen. When it comes to desserts, children are usually excited. Their enthusiasm for gooey treats can be contagious. Keep in mind, though, that most children are not as interested in the delicate tortes or flaky pastries adults enjoy. A kid-friendly dessert might be simple with few ingredients, but it also might not be as delectable for adults. However, there are some recipes for kids that adults find equally appealing and satisfying. Enjoy making the following dessert recipes for kids. All of them taste great with a cold glass of milk. With a knife, cut a ripe banana length-wise and place it on a plate. Add two scoops of vanilla ice cream on top of the banana. Drizzle chocolate syrup on top of the ice cream. Add whipped cream and nuts. Place cherries on the very top. This is such an easy recipe that even young children can participate in the preparation. Let them create their own masterpiece according to their likes. Some kids may omit the nuts or cherries while other children might enjoy extra cherries for their dessert. In a medium bowl, sift together the flour, baking soda, and salt and then set it aside. Using another bowl, add the butter and cream cheese and beat together with an electric mixer until smooth. Gradually, add the sugar and vanilla. Slowly add the flour mixture to the egg on low speed. 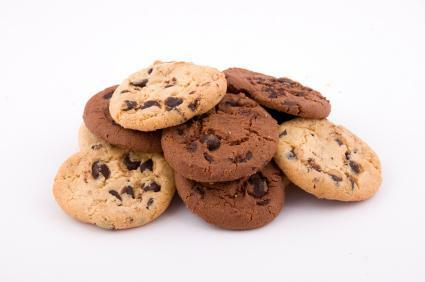 Bake 13-15 minutes at 350 degrees F.
These chocolate chip cookies make great desserts and can also easily be packed in school lunch boxes. Grease the bottom and sides of a 1.25 quart casserole dish with the butter. Spoon the frosting into the dish and spread it evenly so it covers the whole bottom. Cover the entire surface of the frosting with the marshmallows. 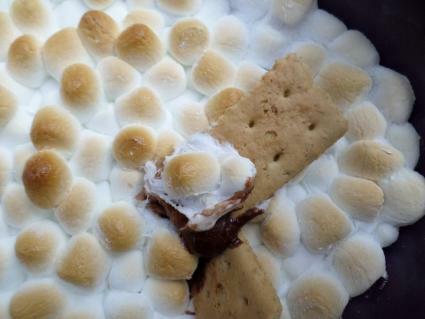 Place the dish in your oven's middle shelf and bake for about 13 minutes until the marshmallows are light golden brown. Watch carefully to make sure they don't burn. Remove the dish from the oven and let the dip cool for about 5 minutes. Serve while still quite warm with graham crackers, vanilla wafers, or your favorite cookies. You can reheat the dip in a microwave at 80% power for 30-second intervals until it's as warm as you want. This recipe serves approximately 8 people and makes a particularly awesome slumber party treat. Bake the cookie dough after first spreading it out on a greased pan. If you have a pizza pan, this will be best for creating the round shape. In a bowl, combine cream cheese and confectioners sugar; blend well. Spread on cookie dough crust. Top with your child's favorite fruit. Slice into wedges as you would a pizza and serve. In a medium bowl, mix cream cheese and 1/3 cup of sugar. Add an egg. Beat well. Stir in the chocolate chips. Set aside. In a large bowl, whisk the flour, sugar, cocoa, baking soda, and salt. Fill the muffin cups about half full with the cocoa mix. Place a tablespoon of the cream cheese mixture in the center of each. Bake at 350 degrees F. for 20 to 25 minutes. Frost with any kind of icing or with a dusting of powdered sugar. Top each cupcake with a piece of chocolate before serving.